The most addictive sweet and salty Keto treat! 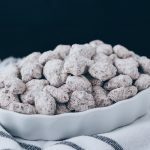 Make Keto Puppy Chow for your next party, or just enjoy it as a delicious low carb and sugar-free snack! I’m addicted to this Keto Puppy Chow right now. As in, the photos for this post almost didn’t get taken before it was all gone! It’s that delicious. It’s no secret that in my pre-low carb, pre-Type 1 Diabetes life, I LOVED Chex cereal. If you haven’t made my Keto Faux Chex Party Mix recipe yet, you should probably print that recipe off right now too. Just trust me. 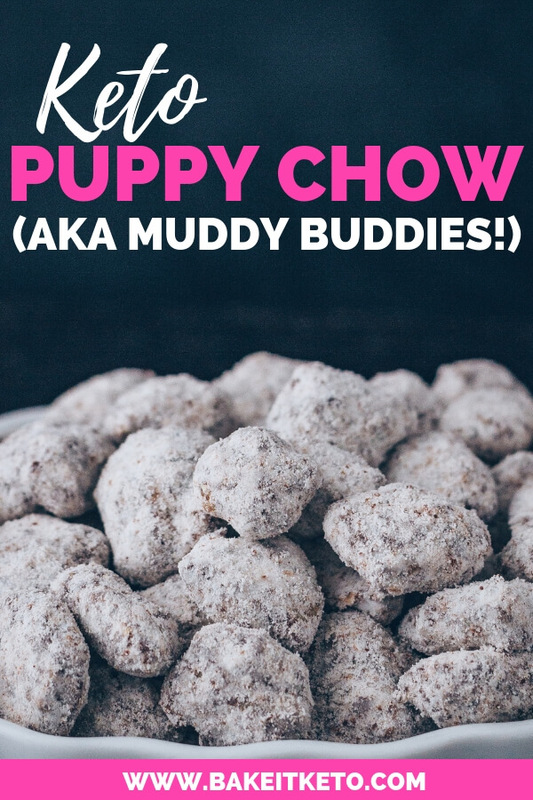 Traditional Puppy Chow is super simple to make. Unfortunately, aside from the butter, most of the usual ingredients aren’t keto friendly. Pork rinds are the perfect, crunchy, keto cereal replacement for Chex in this recipe. My favorite pork rinds to use in these low carb Muddy Buddies are the Epic Himalayan Pink Salt Oven Baked Pork Rinds. I like these pork rinds for all of my recipes because they have a great neutral flavor, but I also love Epic’s “nose to tail” commitment. Supporting holistic land management efforts is just as important to Epic as it is to me, so I’ve been purchasing their products for years. I purchase this 4-pack of Epic Himalayan Pink Salt Oven Baked Pork Rinds from Amazon to save a few dollars. It’s very important to check your peanut butter’s ingredients. Most are made with a whole lot of added sugar. I also do my best to avoid inflammatory oils, so I always look for peanut butter with no more than two ingredients: peanuts and salt! This 365 Organic Peanut Butter is a great choice because the only ingredient is peanuts! To keep this Puppy Chow recipe low carb, I used Lily’s Sugar-Free Chocolate Chips. Like the Epic Pork Rinds, I buy the 4-Pack of Lily’s on Amazon to save a little vs the grocery store chain near me. Keto ingredients aren’t cheap, so I try to save where I can! Traditionally, Puppy Chow gets it’s sweet outer coating from a dusting of confectioners sugar. For this low carb version, I highly recommend that you try allulose! Never heard of allulose? It’s a non-caloric sweetener called a rare sugar. But since it causes very little fermentation in the gut, it might be a great choice for anyone who experiences digestive issues with Swerve or other erythritol products. But here’s the best part – it tastes more like sugar than any other keto friendly sweetener I’ve tried! So in recipes like this where the sweetener flavor isn’t being masked by other ingredients, I love using allulose. I haven’t found a confectioners allulose yet, so I just buzz my granulated allulose in the blender until it reaches the right consistency (this only takes a minute). I buy Hoosier Hill Farms Allulose on Amazon and I use my Nutribullet to blend it up. My Easy Keto Faux Chex Mix Recipe– The perfect snack when you want something salty and not sweet. Epic Beef, Apple, & Uncured Bacon Protein Bars– Don’t let the word apple in the name fool you! These have only 4g total carbs per bar. I have them on my Amazon Subscribe & Save list, and I always keep one in my purse. Coconut Flour Keto Cheese Crackers– This recipe from Sugar-Free Mom is super easy, crunchy, and delicious. Now that’s a keto snack recipe trifecta! 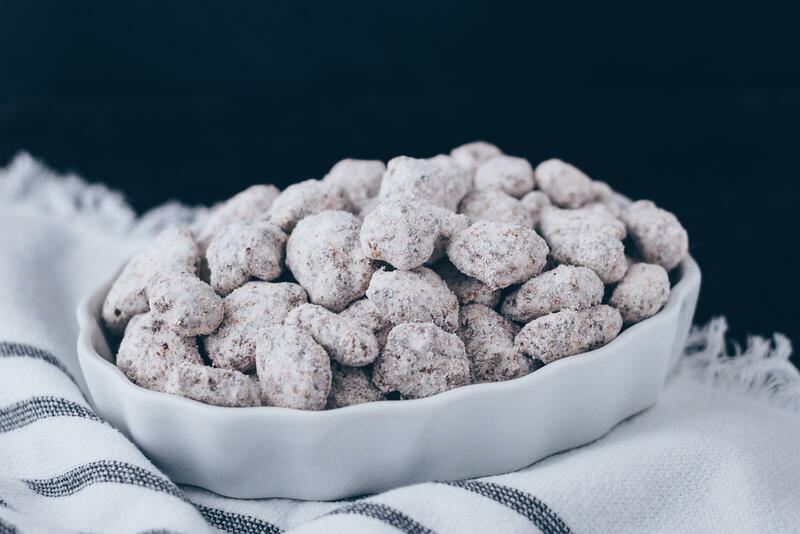 If using granulated Allulose to coat the keto puppy chow, you'll need to buzz it in a blender to create the consistency of confectioners sugar before you begin. I use my Nutribullet to do this. I prefer using Allulose in this recipe since it tastes the most like sugar in my opinion. I use and like Hoosier Hill Farms Allulose. One at a time, empty the pork rind bags into a gallon zip top bag and break them into Chex-sized pieces with a few whacks of a rolling pin. If any large pieces remain, just break them in half with your fingers. Transfer the pork rinds to a large bowl. In a medium heatproof bowl combine the chocolate chips, peanut butter, and butter. Gently heat over a double boiler, stirring regularly, until the chocolate and butter have melted and combined with the peanut butter to form a smooth mixture. Add the vanilla, cinnamon, and salt to the chocolate mixture and stir to combine. Scrape the chocolate mixture out into the bowl of pork rinds and carefully stir to coat every piece. At first, it may not seem like enough chocolate - just keep gently folding and stirring the mixture, making sure to scrape the bottom and sides of the bowl regularly. Pour the powdered Allulose or confectioners Swerve into a large clean bowl and dump the pork rind mixture on top. Shake and stir the mixture to dust every chocolate pork rind piece. Spread the finished Keto Puppy Chow out on a lined cookie sheet to cool completely. Store in an airtight container. 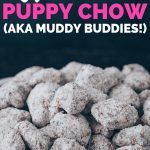 WANT TO SAVE KETO PUPPY CHOW FOR LATER? CLICK HERE TO SAVE THIS RECIPE TO YOUR FAVORITE KETO PINTEREST BOARD! « 9 Delicious Keto Pizza Crust Recipes You Just Have To Try!